Governor writes to centre for all weather, round the year and round the clock operation of commercial flights at Pasighat. The Governor of Arunachal Pradesh Brig. (Dr.) B.D. Mishra (Retd.) has written to the Union Minister for Civil Aviation Shri Suresh Prabhu for installation of Landing System, which will enable all weather, round the year and round the clock operation of commercial flights at Advance Landing Ground, Pasighat. In his letter, the Governor said that the Advance Landing Ground, Pasighat, East Siang District of Arunachal Pradesh is the only operational airport for fixed winged aircraft passenger service in our State. 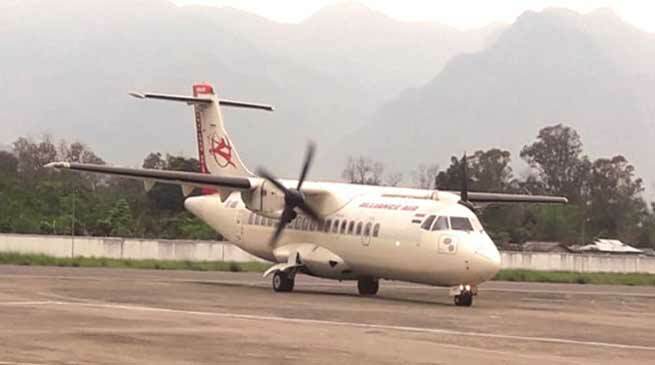 He further said that at present, Alliance Air’s ATR-42 aircrafts are operating from Lokpriya Gopinath Bordoloi International Airport, Guwahati thrice a week on alternate days. The commencement of the ibid flight was overwhelmingly welcomed by the people of Arunachal Pradesh as a very important amenity for the State. Referring to recent report in the Print Media, the Governor said that the only fixed winged air service, which started in the month of May 2018, is undergoing frequent cancellations. The Governor informed the Union Minister in his letter that the State of Arunachal Pradesh is, strategically, a very important Frontier State bordering China. In the interest of our National defence as also the onerous public interest like medical emergencies and the like, suitable landing system at the Advance Landing ground, Pasighat is an inescapable requirement.